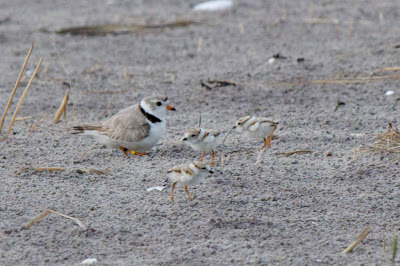 You may remember that last winter, I wrote about a research program studying the Piping Plover population that winters in the Bahamas. Bird banders caught 57 plovers and marked their legs with colored plastic bands so that the individual birds could be identified by sight – with spotting scopes, possibly binoculars, or cameras with telephoto lenses. This makes it easier birders and refuge staff to report the locations of the banded plovers as they migrate and breed. Now that the plover breeding season is winding down and birds are starting to leave their breeding grounds, we can review the findings so far. During the breeding season, 38 of the 57 plovers were seen on their breeding grounds. Of those, 14 bred in Massachusetts; 10 in New York; 3 in Rhode Island; 2 each in New Jersey, Virgina, and New Brunswick; and 1 each in North Carolina, Maine, Nova Scotia, Newfoundland, and Connecticut. One of the New Jersey plovers was first spotted in Montauk, Long Island, before it moved to Sandy Hook to breed. An additional plover was spotted in Florida but not resighted on its breeding grounds; this brings the total number of resighted birds to 39. 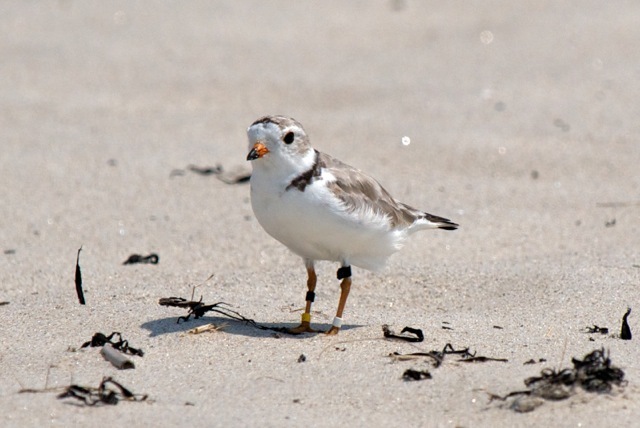 Shorebirds, including Piping Plovers, are already starting to make their way south. One of the Bahamas plovers was resighted at Portsmouth Island in North Carolina on July 13. This individual, a female, had been observed as it bred in Rhode Island and fledged four chicks, so she had a very successful breeding season. Others could turn up at any beach along the Atlantic coast, so all birders should watch for them. What do color bands of The Bahamas plovers look like? ... All have a black flag on the upper left leg. Each have a single white band on one of the lower legs, right or left. Each have two color bands (neither of which is a white band) on the lower leg opposite the leg with the single white band. Colors used were: red, orange, yellow, white, light green, dark green, dark blue, and black. No metal bands were placed on any of The Bahamas birds; nor were color bands placed on the upper right legs of the birds. How should the color markers be reported? When you see a marked Piping Plover, immediately write down a detailed description of the bands and their location on the bird's legs (always using the bird's right and left). Make a note if you are unsure of the color or location of any of the bands or if you did not see all bands clearly. Please report incomplete sighting. You can read more about the program and see an example of how to describe marked plovers at the link. The two photos in this post were taken by David Jones in Massachusetts. 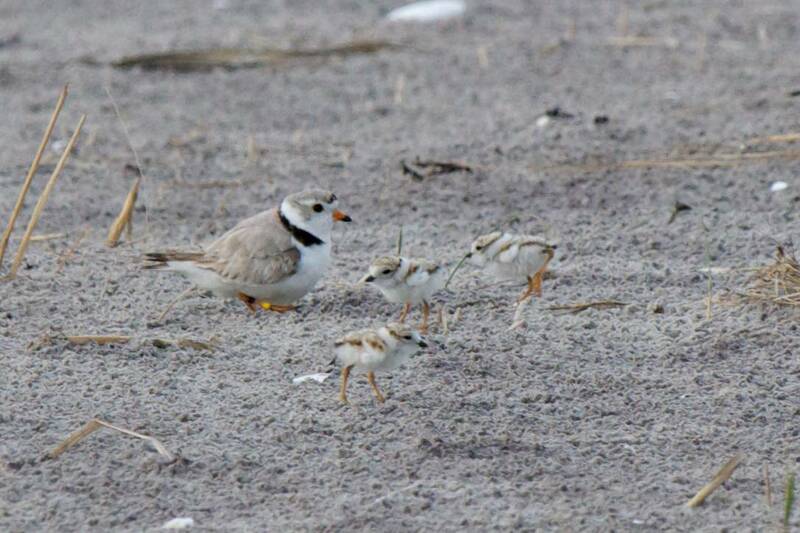 You can find more of his Piping Plover photos and other work at his PBase website. Thanks also to Peter Doherty for forwarding updates about the project.